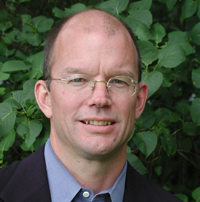 James Wellman is Professor and Chair of the Comparative Religion at the Jackson School of International Studies. He has been at the University of Washington since 2002. He teaches in the area of American religious culture, history and politics. He has published an award-winning book, The Gold Church and the Ghetto: Christ and Culture in Mainline Protestantism (Illinois 1999). He has published two edited volumes, The Power of Religious Publics: Staking Claims in American Society (Praegers 1999); the second edited volume, Belief and Bloodshed: Religion and Violence Across Time and Tradition (Rowman and Littlefield, 2007). Wellman’s most recent book, Rob Bell and a New American Christianity (Abingdon Press, 2012), explores one of the most well-known and controversial evangelical ministers in America. Bell, up until 2011, led a 10,000-member megachurch, and is now pursuing TV opportunities in Hollywood. Bell’s artistry as a preacher, his fearlessness in pursuing various forms of media, makes him an ideal person to examine the future horizon of American Christianity. Wellman’s other publications include an award-winning book, The Gold Coast Church and the Ghetto: Christ and Culture in Mainline Protestantism (Illinois, 1999); two edited volumes: The Power of Religious Publics: Staking Claims in American Society, with Bill Swatos (Praegers, 1999), and Belief and Bloodshed: Religion and Violence Across Time and Tradition (Rowman and Littlefield, 2007). His 2008 monograph, Evangelical vs. Liberal: The Clash of Christian Cultures in the Pacific Northwest (Oxford University Press), received Honorable Mention for the 2009 Distinguished Book Award by the Society for the Scientific Study of Religion. Wellman has recently completed editing a volume with Clark Lombardi, called Religion and Human Security: A Global Perspective (Oxford University Press, 2012). This volume examines case studies of the impact of religious groups on the human security of diverse global populations. His next book project, High on God: How the Megachurch Conquered America (Oxford University Press), is based on a national survey of twelve national megachurches, engaging quantitative and qualitative data from interviews with clergy and laypeople. The book explores the powerful affective forces within these congregations and is a fascinating portrait of the dominance of megachurches in American religious life.